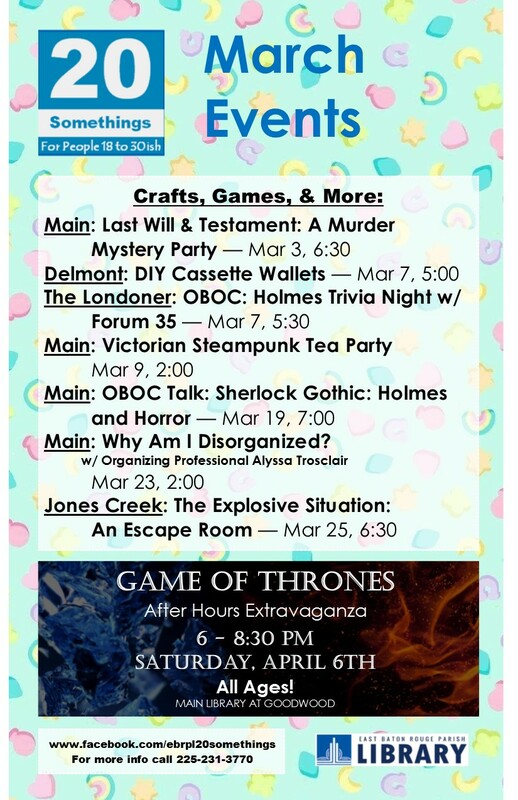 Start your year off with a fun 20somethings activity! 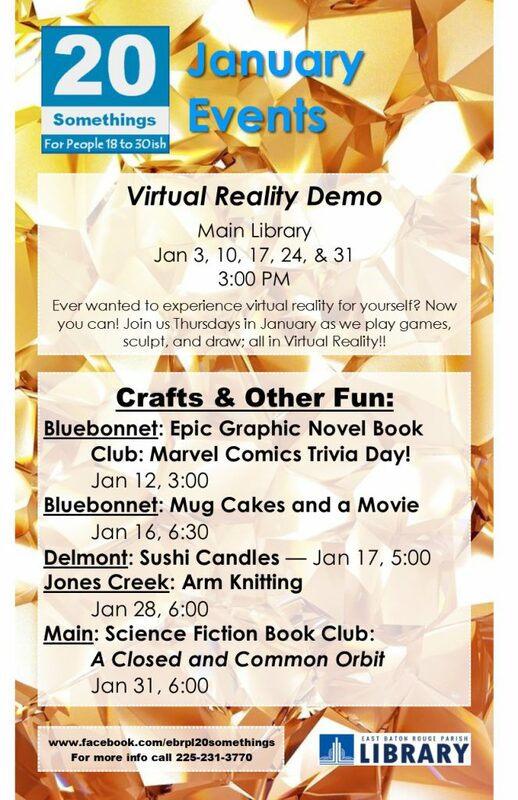 Here’s what’s going on in January. Hey, 20somethings! Give your Netflix account a break and come play a board game with some new friends! 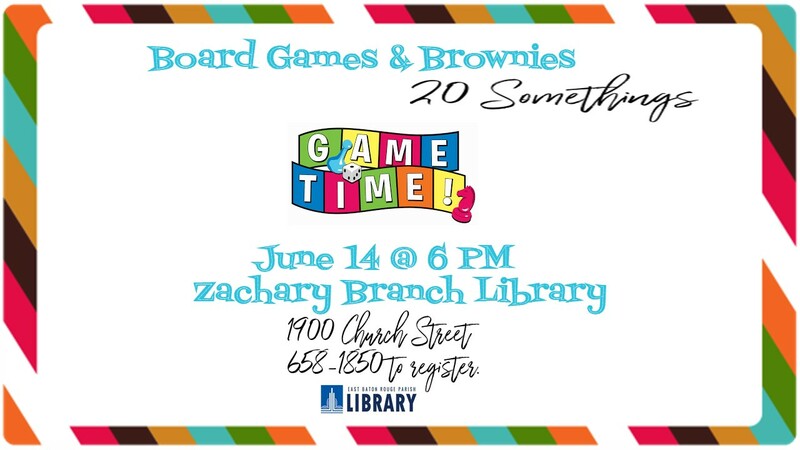 The Zachary branch is hosting a board games night next Thursday, June 14th, at 6 PM. Call (225) 658-1850 to let them know you’re coming, and they’ll save a brownie just for you. Humans between the ages of 18 and 30ish! Have you ever covered for your art by saying you were trying to emulate Picasso? Is this ever the event for you! 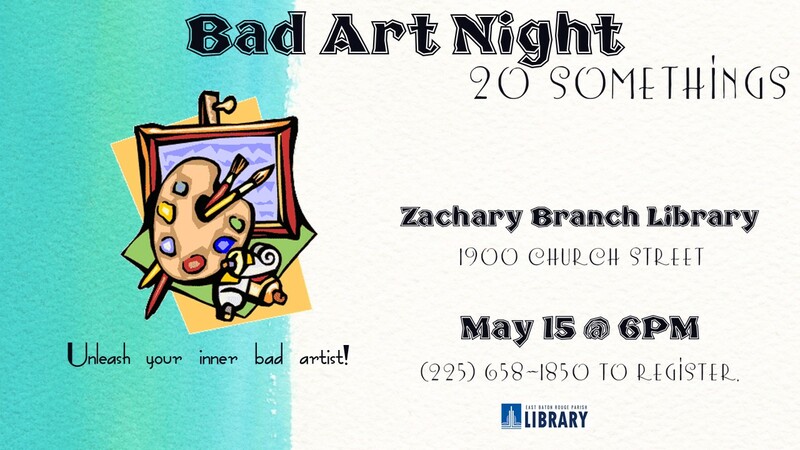 Come make some art so bad it’s good at the Zachary Branch next Wednesday, May 15th, at 6 PM! 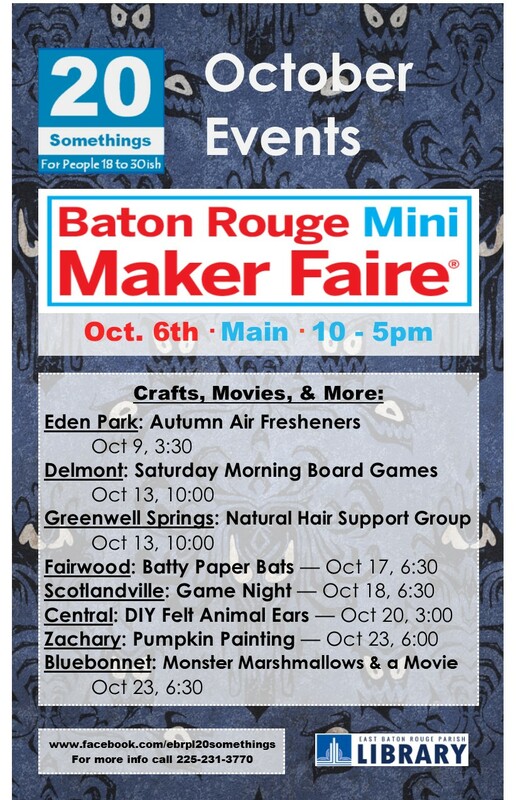 Call (225) 658-1850 to register. Summertime is FUN time! 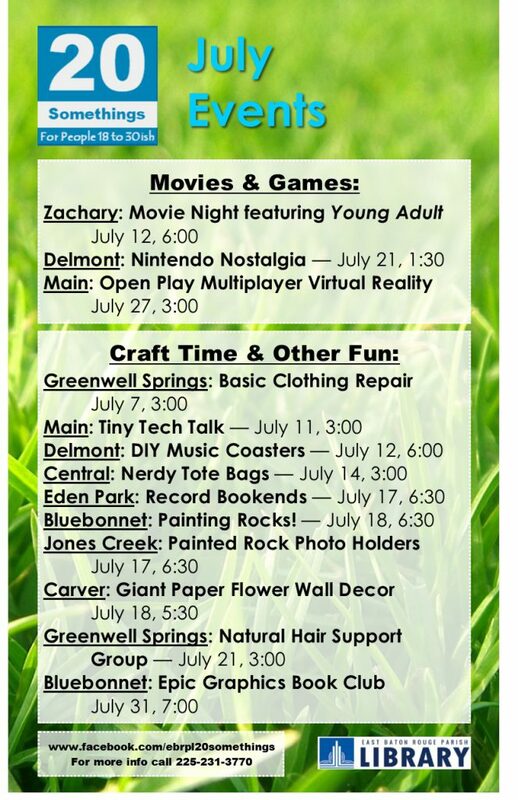 Your East Baton Rouge Parish Library has planned a Summer Reading Program for every age group, so the whole family can participate. Parents and guardians can pick up registration materials for kids ages 0-11 in the Children’s Room at any library location starting Tuesday, May 29, through Tuesday, July 31. Children who reach their reading goals or read at least five books by Wednesday, August 15, will receive a reading certificate, a FREE book, and other cool prizes, plus have their name entered into a drawing for a $50 gift certificate! Summer reading keeps your brain working, and can help you get ready for college and even your future career! It also helps you prepare for the reading comprehension portions included in most standardized tests. Teens going into grades 6-12 can sign up in the teen section at any branch and pick up their reading log starting Tuesday, May 22nd. To complete the program, read any six regular books, or 18 graphic novels, by Wednesday, August 15th, and you’ll receive six Library Bucks (good for paying off fines! ), a drawstring backpack and a pair of earbuds! Plus, if you keep reading, you’ll be entered into the weekly prize drawing. 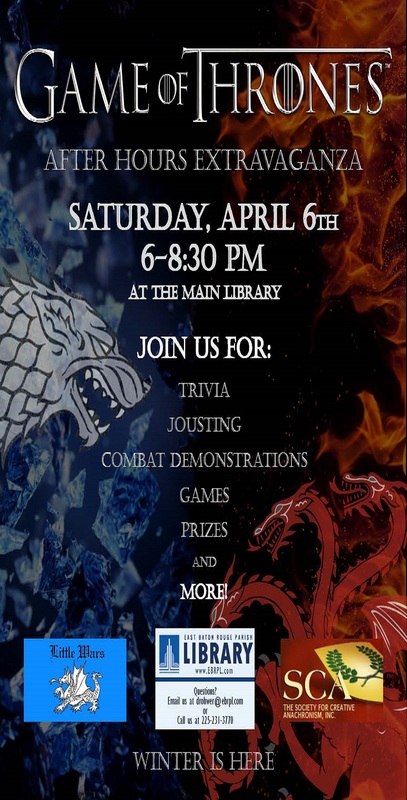 Every three regular books or nine graphic novels you read gets you an entry into the drawing for cool prizes like autographed books, virtual reality headsets and more! 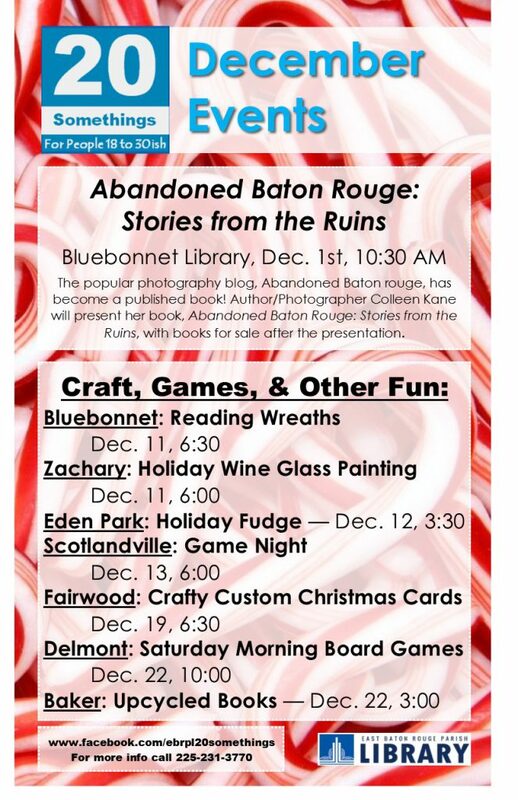 Read as much as you can, because the top reader across East Baton Rouge Parish will receive a Kindle Fire Tablet bundle! Why should kids and teens have all the fun this summer? We’ve got a Summer Reading Program designed just for adults ages 18 and older that will get your pages turning! 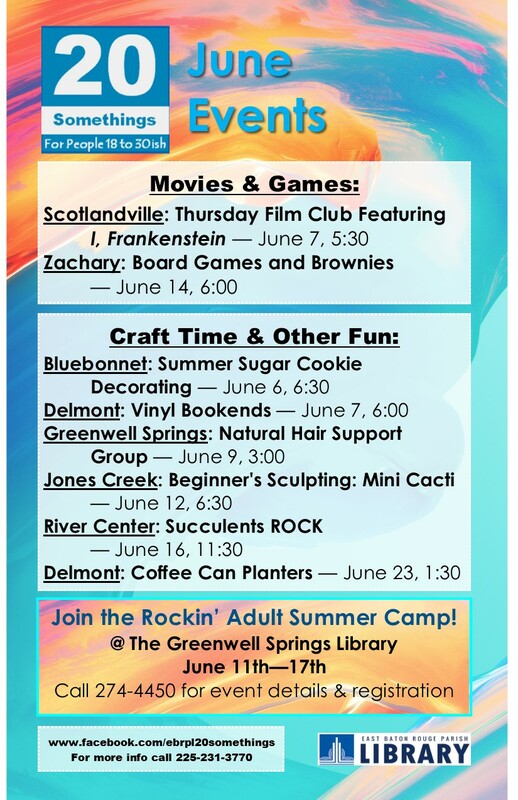 Adults are asked to read three books starting Friday, June 1, and can pick up a log through Tuesday, July 31. Each reader has until Wednesday, August 15, to submit their list of completed books in order to receive a summer prize pack. For more information about the 2018 Summer Reading Program for all ages, contact your Library location directly, or visit us online. Posted on May 4, 2018 May 3, 2018 Categories EBRPL 20somethings, EBRPL Kids, EBRPL Teen2 Comments on Summer Reading 2018!